I've made this refreshing, sweet broth a number of times, using a variety of rosé wines, and I've found Domaine de Pellehaut (bin 25604; £5.15), a gorgeous pink wine from France, to be perfect. As the label says, it has "generous aromas of cherries, strawberries, peaches and white flowers," making it a perfect base for red berries. If you can't find it, any good, not-too-dry, floral and fruity rosé will work. If you don't have a mini madeleine tin (they're available in John Lewis), use a mini muffin tin. Preheat the oven to 170ºC, gas mark 3. Butter a 12-cup mini madeleine tin and lightly dust it with flour. To make the madeleines, melt the butter and honey together in a small pan and leave to cool. Sieve the flour, icing sugar and baking powder together in a large bowl. Stir in the cooled butter and honey mixture, and then the eggs, taking care not to overmix. Fold in the lemon zest. Spoon the mixture into the prepared tin and cook for about 10 minutes or until risen and golden. Leave to cool for several minutes before turning on to a wire rack until completely cold. Store in an airtight tin. Heat the wine and sugar together in a saucepan, and stir till the sugar has fully dissolved. Remove from the heat, leave to cool down, then chill until very cold. Just before serving, halve or quarter the strawberries. Gently remove the redcurrants from their stalks by running a fork down the stalks. 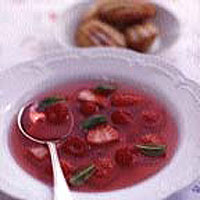 Spoon the broth into shallow soup dishes and arrange the strawberries, redcurrants and raspberries in each dish. Scatter over some small mint leaves. Dust the madeleines with a little icing sugar and serve.